Rockford Drains prevent any off-the-floor sediment, solids, or other foreign waste matter from entering the drainage system. Features include heavy-duty inlet grate, integral deep seal trap, sediment pan, wide anchor flange, double vent connections, cleanout at floor level, 4" auxiliary inlet. Note course of water travel in cut-open view. Arrows designate course from inlet grate A into sediment and mud pan B, under and through separator screen and flow-regulator filter screen C, to outlet. Also note separation and retention, through gravity action, of heavy sludge in sediment pan. A seal against foul odors is formed by the water in the sediment pan B. 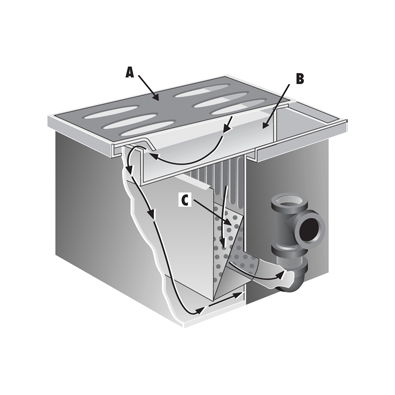 For complete protection of garage and similar types of floor drainage, other Rockford drainage units are recommended for use in conjunction with the SD Series. Oil Separators. Trench Drains. The SD Series Separator-Drain is built of all-welded heavy steel for maximum structural strength and durability. It is enamel coated inside and asphalt coated outside for resistance to corrosion. Unit has removable heavy-duty, non-breakable steel inlet grate. The grate can also be furnished in stainless steel. Separator screen (U-shaped) and filter screen (V-shaped) regulate flow and filter the waste water. They lift out for easy cleaning of the separator-drain, as does the removable sediment and mud pan which traps heavy solids. Standard tapped outlet is separated from main body of unit, providing an outside, visible trap seal. Independent internal vent connection releases trapped fumes. The SD Series Separator-Drain for garage and industrial floor drainage is designed to retain mud, sediment, and greasy sludge or so-called solids in its sediment pan and sludge compartment. In addition, it separates and retains greasy and oily wastes, preventing their evacuation into the drainage lines where they cause blocking and stoppages. Another exclusive feature is the automatic shut-off against incoming waste water when the holding capacity of the sediment and mud pan has been reached. 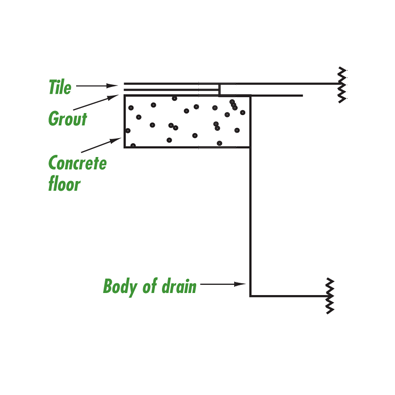 The trap formed where the water passes into the lower section of the unit is the point where stoppage occurs until the drain has been cleaned. Square corners make the SD Series separator-drain ideal for use with any type of tile, eliminating costly tile cutting required by old-fashioned round drains and assuring proper pitch for water run-off without unsightly puddles around the drain. When the holding capacity of the sediment and mud pan has been reached, it will stop entry of incoming waste water through the inlet grate. This is the signal that the separator drain needs cleaning. However, it is best not to wait until this happens. A gradual sluggishness in off-the-floor draining is a warning that the unit is ready for cleaning. Remove sediment and mud pan, and clean it. Lift out V-shaped filter screen and U-shaped separator screen. Replace U-screen, sediment and mud pan, and inlet grate.